Connecting your CallTrackingMetrics account with Google Data Studio allows you to build and share custom reports alongside your data from other platforms. The integration permits Data Studio to access data from your CTM account, and the type of connector you use determines what you will be able to do with that information within Data Studio. The Call Log Connector allows you to build advanced reports using raw data from your call log (nearly all call fields in the log are available to be used as a dimension or a metric in Data Studio). Fields are named using their API labels, but can easily be changed in reports. All call log data is sent unaggregated, which means aggregation should be done in Data Studio. It is recommended to build your report template using a small date range to ensure call data loads quickly. The Activity Report Connector is a quick-setup connector that allows you to build Data Studio reports using any of the dimensions on your existing Activity Reports in CTM. Essentially, this connector allows you to pull what you see on your Activity Reports page into Data Studio. For help with using Data Studio’s interface to build reports, please refer to Google’s support resources. 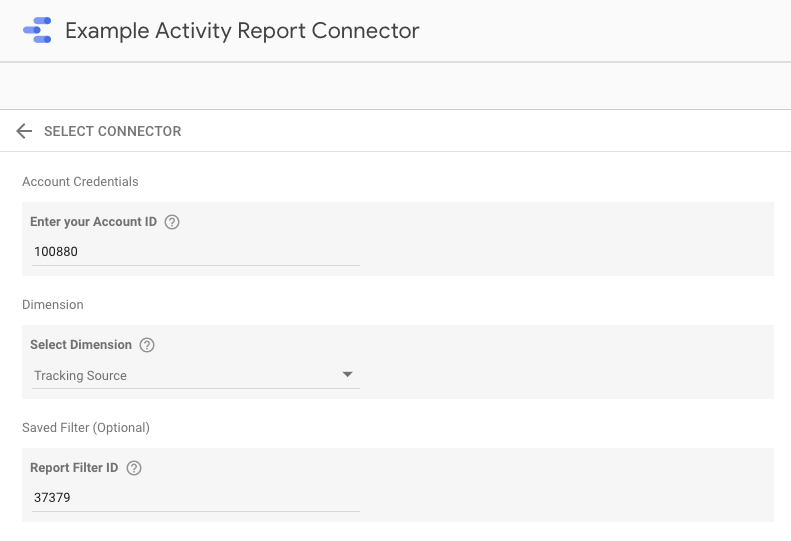 The Activity Reports Connector is essentially a tool to import your CTM Activity Reports into Data Studio. When you first navigate to your Activity Reports, for example, the default view will show you calls for the last 30 days broken down by tracking source. The data you see here is basically what a single connector could pull in to Data Studio, and from there you can use Data Studio to design your own reports around that view or include it in another report you already have with data from other sources. You can choose a different dimension—like agent, day of the week, or tags—and apply filters to narrow down which calls are included in the report. Each connector you create is like different Activity Report view. Data imported using the Activity Reports Connector will be pre-aggregated by CTM before it is sent to Google. Navigate to your Activity Reports (Reporting → Activity Reports). Choose your desired dimension using the view selector and apply any saved filters you’d like. Important note: only saved filters can used with your Data Studio connector. To save a filter, select all the filter options you’d like, then click the Save Filter button at the top of the filter panel. You’ll be prompted to name the filter, then click Save Filter to confirm. When you have your preferred dimension selected and your saved filter created, click Export and select Data Studio. A pop-up window will appear with the list of saved filters you can choose from to apply to your connector in Data Studio. Find the filter you want to use and click Connect. You will be directed to Google Data Studio. If this is the first time you have used a CTM Data Studio Connector, you will be asked to grant permissions for Google to access data from your CTM account. Enter the Basic Authentication Token for your account. On the Data Studio settings page, click the API Integration button to show your authentication token, then copy and paste it into the field in Data Studio and click to continue. This will open a Data Studio connector creation page in a new tab. The dimension you had selected and the ID for the filter you selected will be pre-populated here, but you will need to do a few more things before the connector can be saved. First, give your connector a name. At the top of the page you will see “Untitled Data Source.” Click here to rename the connector (you may find it helpful to use the name of the dimension you are using, such as “Calls by Tracking Source” or “Calls by Agent”). In the Account Credentials section, you will need to enter your account ID. Your CallTrackingMetrics account ID can be found in your Settings menu. Check “Use report template for new reports” to use the report template we created to help you get a jump-start in building your report. This is optional, but we recommend trying it for the first report you create as a starting point. Note: You may notice some broken graphs when you initially set up a report with this template and connector. This is because the template incorporates multiple dimensions into a single report. To get the other graphs working, you’ll need to repeat the process above using additional dimensions to fill in the rest of the report (or customize the report to include anything you need). On the next screen, you’ll see details of the connector you’ve created. Click Create Report to start a new report with this connector. The Call Log Connector allows you to build advanced reports using raw data from your call log. Nearly all call fields in the log are available to be used as a Dimension or a Metric. Fields imported into Data Studio are named using their API labels, but this can easily be changed in the reports you build. It is recommended to build your report template using a small date range to ensure call data loads quickly. All call log data is unaggregated when it is sent to Google, which means aggregation will be done by Data Studio. Navigate to Settings → Integrations → Data Studio. If you wish to include a saved filter in your connector, you’ll begin your setup from the Manage Filters page instead. Locate the saved filter you wish to use and click Call Log in the Data Studio column. (To save a filter, open the Filters panel in the call log, select all the filter options you’d like, then click the Save Filter button at the top of the filter panel. You’ll be prompted to name the filter, then click Save Filter to confirm.) If you are using this option, skip to step 3. In the Community Connectors section, click the Call Log Connector button. You will be directed to Data Studio. If this is the first time you have used a CTM Data Studio Connector, you will be asked to grant permissions for Google to access data from your CTM account. If you wish to view data from all of your subaccounts in the same connector, you’ll need to use your agency’s authentication token. This token can be found on your Agency Settings page. Now, give your connector a name. At the top of the page you will see “Untitled Data Source.” Click here to rename the connector (you may find it helpful to use the name of the account or the name of the report you intend to build with this data). 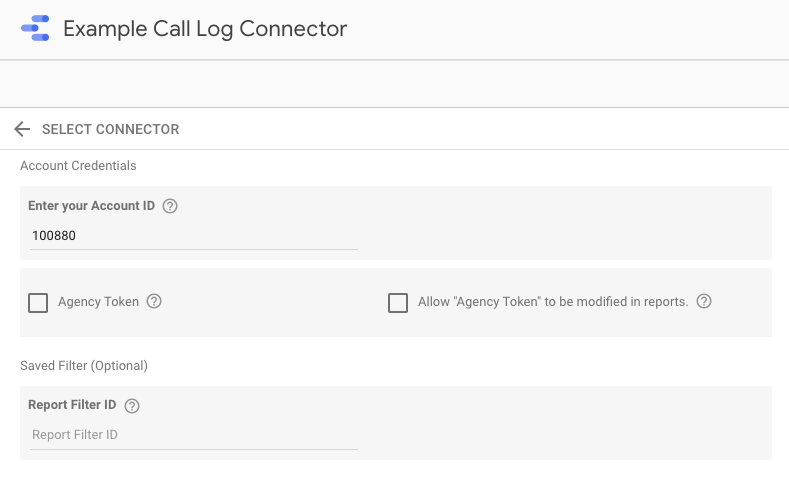 If you set up the connector using your agency’s authentication token, you will need to use your agency ID instead, then check the box labeled Agency Token.